Announced at Tuesday’s Apple event, the iPhone 5s contains two big hardware improvements: a faster A7 processor with 64-bit architecture and a motion co-processor that gathers data from your device’s sensors. While these under-the-hood features might not sound very fancy to the average consumer, they have iOS developers buzzing over potential implications. We queried several to see what they had to say about Apple’s impending hardware improvements. Apple’s new A7 ARM chip powers the iPhone 5s; the company boasts that it’s not only twice as fast as the iPhone 5’s A6 chip, it offers just as good—if not better—battery life as the previous model. And that’s not all: The A7 is the first smartphone chip to feature 64-bit architecture. 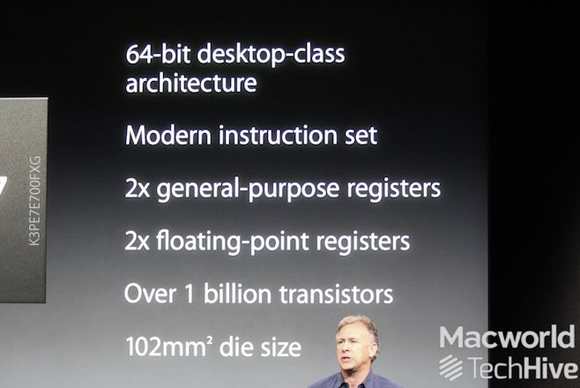 “I don’t think anybody was expecting [64-bit] so soon,” PCalc developer James Thomson told Macworld. Rumors around the Web had pegged many of the improvements in the iPhone 5s long before the event, including the rumored fingerprint scanner. But Apple’s new M7 co-processor was a largely unexpected box on the Bingo card: It tracks motion data from your device’s accelerometer, gyroscope, and compass without needing to wake up the A7. Does the iPhone have a chance to unseat players like Jawbone and Fitbit from the fitness-tracking realm? Karjalainen would like to believe. According to his numbers, Moves currently tracks over two billion steps a day; in contrast, information from Jawbone earlier this year indicated that the company’s Up wristband tracks over one billion steps per day. Macworld reached out to Fitbit for comment, but as of press time had received no response.